Shall the School Board of the Palmyra-Eagle Area School District be authorized to exceed the revenue limit under Section 121.91 of the Wisconsin Statutes in the amounts set forth below on a non-recurring basis over a period of four years commencing with the 2019-20 school year as follows: $1,750,000 in the 2019-20 school year, $2,500,000 in the 2020-21 school year, $3,250,000 in the 2021-22 school year and $4,000,000 in the 2022-23 school year for the purpose of paying District operation and maintenance expenses as provided in the foregoing resolution? If you support the proposed question, you would vote yes. If you do not support the proposed question, you would vote no. What will happen if the referendum passes? What will happen if the referendum does not pass? Why is this referendum necessary? The amount of revenue the district is generating is less than the expenses the district has. 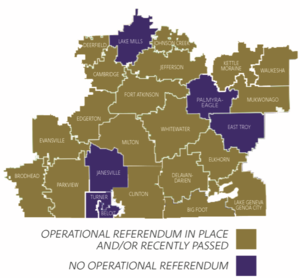 The operational referendum will give the district the ability to collect tax above the revenue limit for operating and maintaining the district. What will the referendum cost? *The referendum dollar amounts are added to a 2018 tax bill, not to each new bill year after year. *Annual impacts will be reflected in the 2019, 2020, 2021 and 2022 tax bills. Annual impacts will be reflected in the 2019, 2020, 2021 and 2022 tax bills. *Current long term debt of PEASD would be part of an asset/ debt calculation done by the School District Boundary Appeal Board and would be distributed amongst other school districts involved in the dissolution process. Operational referenda are more common than ever. The map below represents school districts in our area that rely on referenda to maintain operations. What has the district done to reduce expenses? Members of the Palmyra-Eagle Area School District School Board will be present to speak with you, answer questions, and listen to your input and feedback. 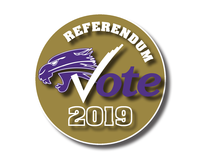 Click here for absentee voting information.